After waking up at our first campsite- a small space with a tattered A-frame picnic table covering- we began to pack the tent away as we had each day the year before, as we would each day left on this trip. We get up early but not too early. 6:30am usually. After brushing our teeth and packing the rest of our things away we pulled out of Taos toward Valley of the Gods. We took turns driving miles through mountains and watched the New Mexican landscape turn into the red Arizona we remembered and dreamed about. Here the roads wind around rocks and mountains, often slowing down to 20 mph around many of the tight curves. The higher we climbed and the tighter the turns, we started to notice more and more memorials lining the edges of the road. Flowers covered crosses, covered stones and dirt. After flying by so many, I decided to pull the car over to take some pictures. The first we stopped at was very extravagant and well maintained. A planter made of stones that resembled a cross held a dozen or more bouquets of fabric flowers. Most looked pretty recently placed. Solar lights lined the gravel. The wooden cross at the head of the monument showed a date ending in 2016. Celeste and I both noted that the man would have been around our parents age. A variety of toy motorcycles could be found at the site so we were able to get an idea of what had happened to this man. Stopping here didn't feel like visiting a grave. 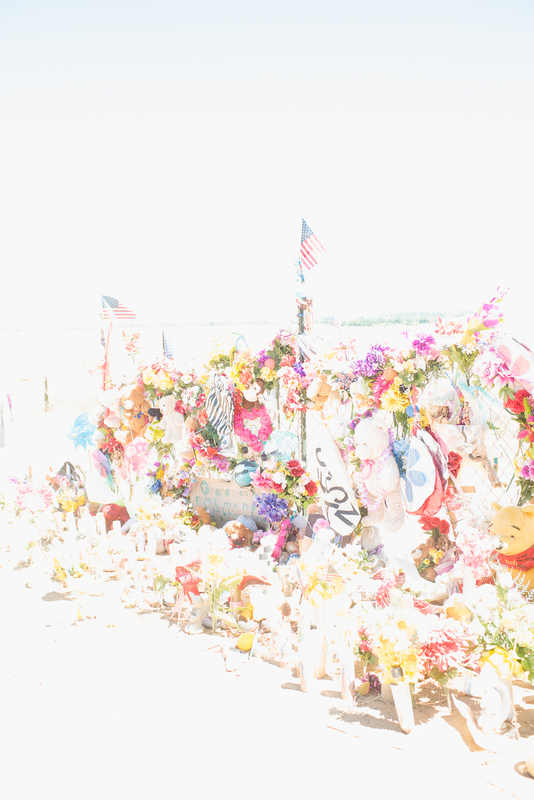 There we were standing by the edge of the road on a road trip we had planned, two girls from Missouri, remembering someone we never knew. It kind of felt like visiting. We got back in the car and drove until we saw another. 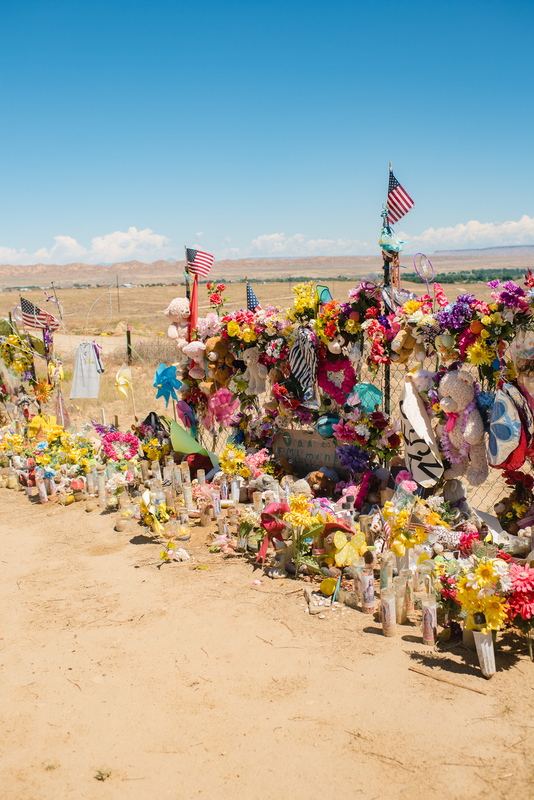 Driving 80mph on a desert highway makes it easy to miss the sanctuaries made to others' loved-ones. The second one we stopped at was even bigger than the first. But this one was different. Signs hung on a fence reading "Justice for Ashlyn Mike". 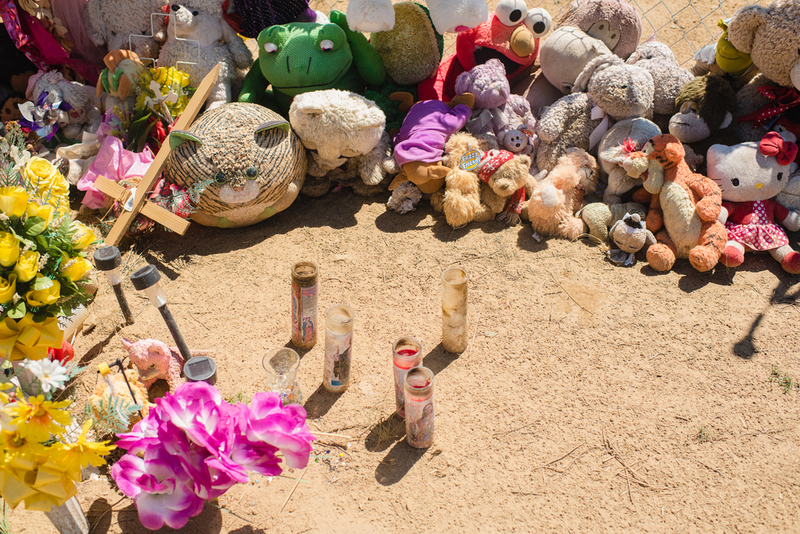 There were dozens of melted candles, stuffed animals, flowers balloons and wind chimes. Someone even left a bottle of finger nail polish. We read so many notes and slowly pieced together the information. Ashlyn Mike was a little girl. She died earlier this year. She was murdered. And so many people loved her and came to this spot to burn a candle and grieve. We read more about the girl when we returned to the car. A simple "Ashlynn Mike New Mexico" search brought up articles of her story. 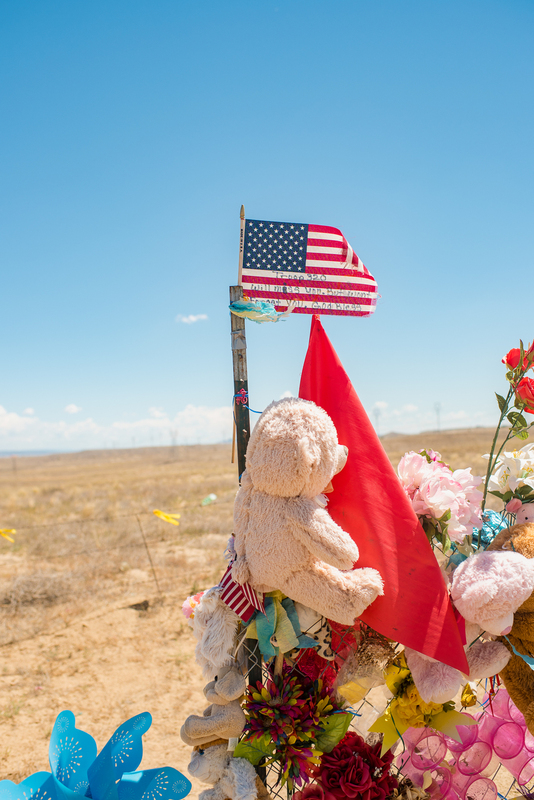 She was a local 11-year-old Navajo girl who was lured away, stripped of her clothing, and killed in New Mexico desert. The response time of the local authorities spanned several hours and Ashlynne was not not found until the next day. 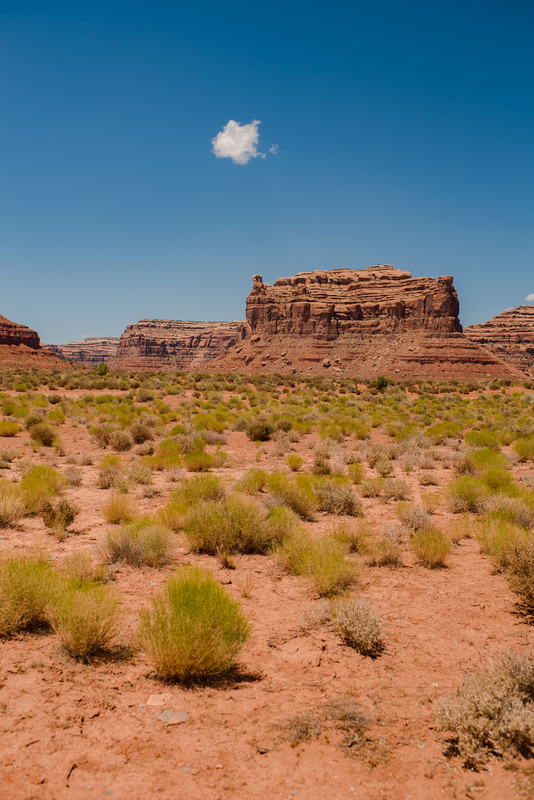 Many are demanding an increase in authority numbers to help span the gap in the remote Navajo nation. I thought about Ashlynne a lot for the rest of that day, astounded at the amount of land that surrounded these people, beautiful but also deadly. You can read more about Ashlynne's story here. You can also keep up to date with the latest news by liking this facebook page. Sometime after crossing the border to Utah we made it to Valley of the Gods. 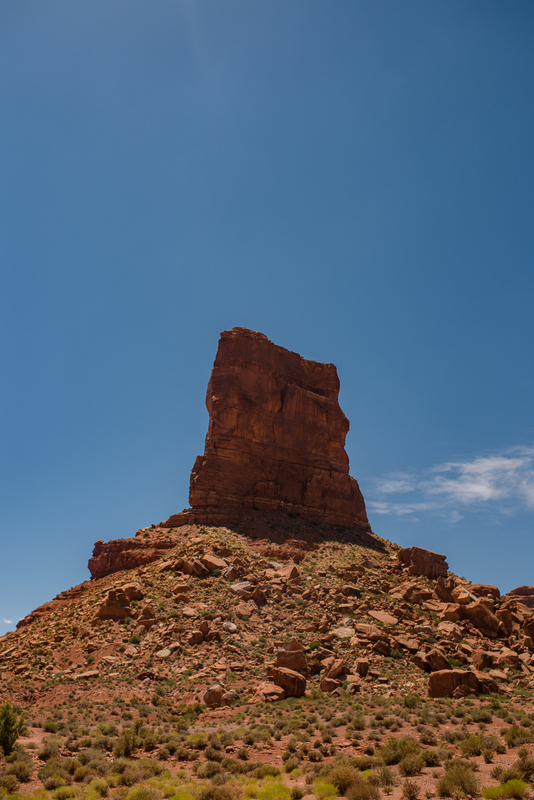 Valley of the God's is the less-traveled cousin of Monument Valley. It is also free, some claim it's the better of the two. A long dirt road led us closer to the giant red rocks we could see from the highway. We stopped to stretch our legs and take a few photos. When another car wasn't coming down the road, the silence was magnificent. It was so loud. I'd never heard something so quiet demand attention. Time and landscape allowed, I would have liked to hang a hammock and nap away the afternoon between the giant red walls surrounding us. It was really gorgeous. 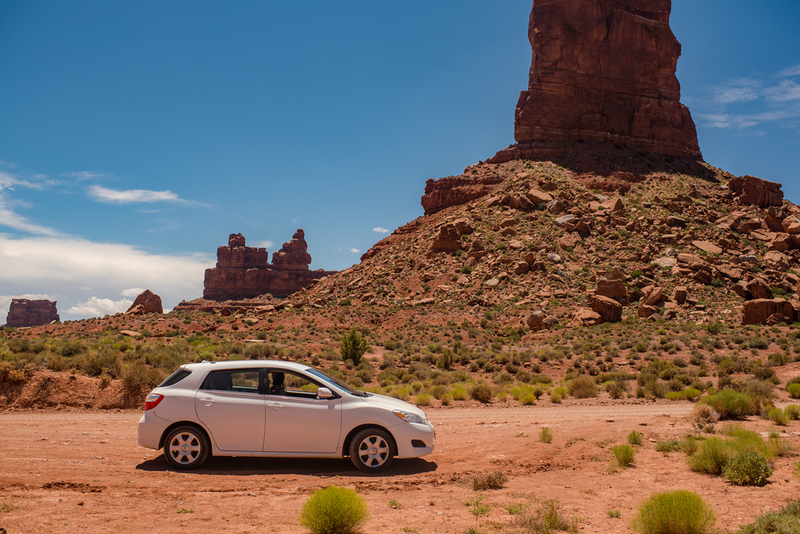 We didn't make it to Monument Valley, but based on the remote location and the lack of other tourists, Valley of the God's was the spot. 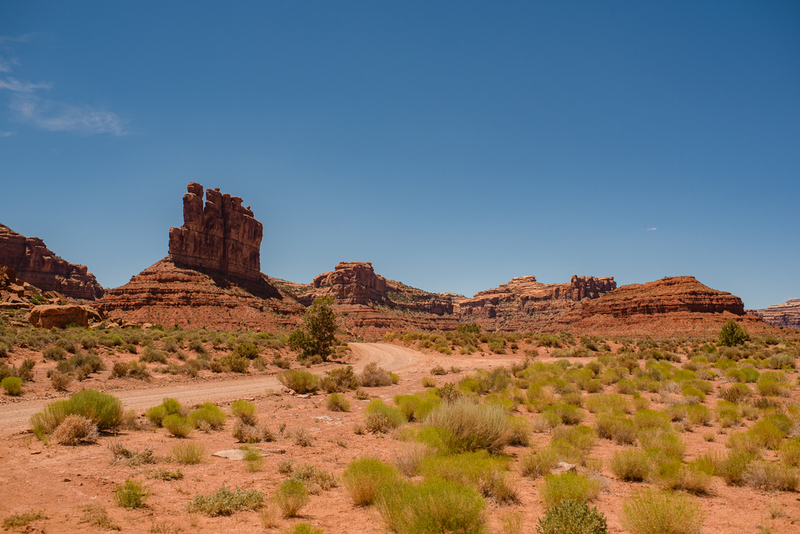 We drove next to Monument Valley on our way back to our camp for the night and that seemed to be just enough. Lone Rock Beach is a primitive campground off of one of Lake Powell's many coves. We visited here two years before and it was infamously our worst day of that trip. The vibe (RIP my favorite car) immediately got stuck in the sand, we had trouble pitching our tent in the middle of a sandstorm so we gave up, defeated, and slept in our hot car up in the parking lot. But the swim we had the following morning made it our favorite spot on the trip. We pulled into the same parking lot on day two. We had already made the very safe decision to park in the lot and walk to the shore, but as we sat watching the many (more than we'd seen before) cars and people effortlessly drive the paths down, we decided to take the risk. Driving in deep sand feels worse than ice. I imagine it similar to the damage of a banana in a Mario Cart race. The tires spun and we fish-tailed around for just a second, then we found solid ground. We pitched the tent, blew up our floaties and headed down to Lake Powell, where we floated until it was too dark to float. I made potatoes and corn in a pan on our stove and covered them in copious amounts of pepper to make up for the blandness. It was too much pepper. We ate and we sat by our tent while families and others celebrated Independence Day weekend around us in their tents and RVs. The porta-potties smelled awful and it was almost too loud to sleep. But we didn't get stuck in sand and we were camping feet away from Lake Powell, nothing to complain about.